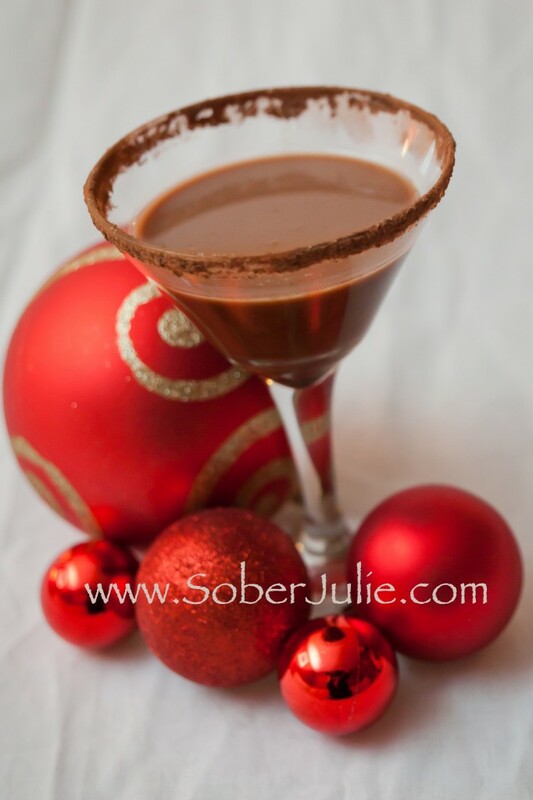 With just a few ingredients, a little bit of heat and a snazzy glass the Cocoa Mock-Tini Mocktail is one of the most attractive drinks I’ve ever seen! If you have a weakness for chocolate you’re going to thank me for this one! Combine sugar and cocoa powder together in a small bowl. Set aside two tablespoons of the mixture on a plate. In a small saucepan bring the remaining sugar mixture, cinnamon and water to a simmer over medium-high heat, whisking occasionally until sugar is completely dissolved. Slice into the lemon wedge; run the cut lemon around the edges of four martini glasses and dredge the wet rims through the sugar and cocoa mixture on the plate to coat. Pour one cup of almond milk into a cocktail shaker, add the cooled syrup and one cup of ice cubes. Shake vigorously until chilled and strain into two glasses. Repeat for remaining two glasses and garnish as desired. Thank you for all of your mocktail recipes! I don’t drink, but I love having some “pretend” drinks for when others are drinking!